This pond is located within Nara Park, and has a circumference of 360 meters. 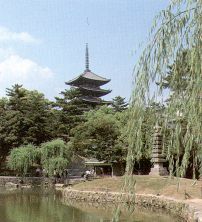 The five-storied pagoda of Kofuku-ji Temple, as well as the willow trees surrounding the pond reflect beautifully in his surface, and are recognized as one of the Eight Views of Nara. 20 minute walk from JR Nara Station. 5 minute walk from Kintetsu Nara Station. Uneme Festival: Yearly on "Autumn Day"